i am a great believer in travelling light, more for reasons of security than for any reticence to exercise those arm muscles at buchanan bus station. additionally, if you've ever travelled on the m v finlaggan, those steps up to the passenger deck are steeper than the north face of annapurna and i'm less than excited at the prospect of clambering upwards while carrying all my worldly possessions in a bag. or bags. the security to which i refer has no bearing on external sources, but everything to do with my own. i generally travel with one relatively small rucksack in which i might carry my macbook air, lunch for devouring on the bus and copious amounts of reading material. many too many have advised that a man with such faith in products from apple inc. really ought to have an ipad in tow with obscene numbers of books and magazine apps in order that i may travel a tad lighter than paper will allow. however, paper and ink have qualities that have me enthralled for the time being at least. this level of travelling light benefits my personal security because there is pretty darned close to nothing to forget, misplace or lose completely. a single rucksack will generally suffice for the lightning trips i have recently made to scotland and to the great metropolis, mostly through judicious packing and a cultivated ability to minimise any amount of clothing that might suggest itself prior to travel. however, there are obviously going to be occasions when such minimal accoutrements are simply not enough, especially if the likelihood of a bike ride features prominently on the horizon. 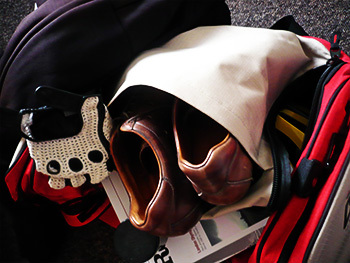 i am fairly sure, without the need to try, that my sole rucksack would be hard pressed to eat a whole helmet, let alone cope with a pair of cleated shoes. for reasons of uncertainty regarding the transportation of bicycles to and from the island, or perhaps simply my fear of those uncertainties pointing the finger directly at me, i have tried manfully to arrange for a loaner or review model to be waiting at the other end. though this does divest me of the need to consider quick release levers, track pumps and allen keys, it in no way removes the need for appropriate clothing to last a period of several days, a pair of pedals that match the cleats on my shoes and the helmet that wouldn't fit in my rucksack. and maybe, just maybe, i'd need a couple of bottles for that review bike's bottle cages. there are a number of bags on the market nowadays that will cover most if not all of those eventualities, one or two of which have been carefully ascribed to the cycle market. 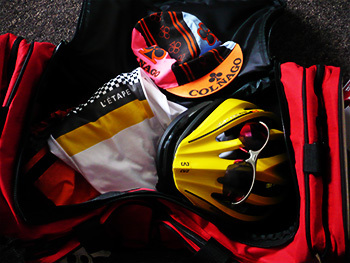 others are perhaps simply referred to as sports kit bags, appropriate in many cases, but perhaps not all. the former is the preserve of the latest offering from rob and paul at ventoux wear. it is of pertinent note that the company was named, rather obviously, after the french mountain oft featured in the tour de france, but related to the point at which bradley wiggins secured his fourth place in 2009.
straying purposely from their origins as progenitors of notable cycle t-shirts, ventoux have recognised my potential plight in travelling along with nearly every item of cycle clothing i own (just in case, you understand). their event bag, constructed from waterproof polyester and rip-stop nylon sells for the obscenely low price of £50, the sort of expenditure that it is easy to justify whether you actually need one of these at the moment or not. the 70cm length and 33cm width are festooned with pockets adjoining the capacious central space that almost requires a tour guide of its own. there's a full length waterproof pocket in which to place the grubby stuff once you've worn it (remember, 'cross season is not that far away), there's a huge pockety bit on the zipped cover, two on the opposite side to the waterproof enclosure which have numerous internal slots for pens, allen keys, multi-tools, phones, wallets, money, possibly even a saddle. 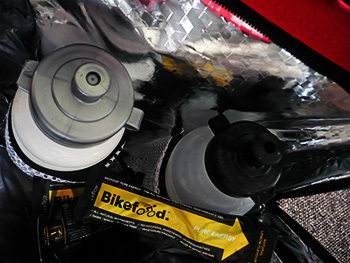 but the piece de resistance is surely the insulated cooler packs at each end of the bag, with room for filled water bottles and extra ice packs to keep them from becoming hot drinks. the latter is a less than palatable option in the heat of battle. carrying all this lot about could demand maybe the occasional gym session, depending on how heavy the mud is on the soles of your spd footwear. but this is ameliorated by a padded hand grip that can be separated for access to the bag's contents and a shoulder strap that will surely allow the other hand to wheel the bike in a forward motion. it is a comforting benefit of modern cycle paraphernalia that much of it is incredibly well designed and more than fit for purpose. 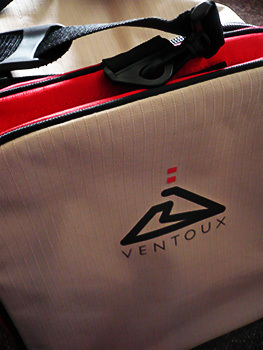 the ventoux event bag is no exception. 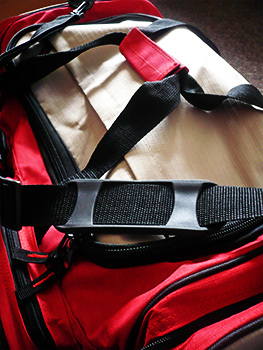 you need only look at the quantity of relevant items that made their way into the bag to see just how pragmatic an item of luggage this truly is. go online right this minute and order before rob and paul realise what an elementary error they have made by pricing it this low. this applies just as much to those who have yet to buy their first bicycle.